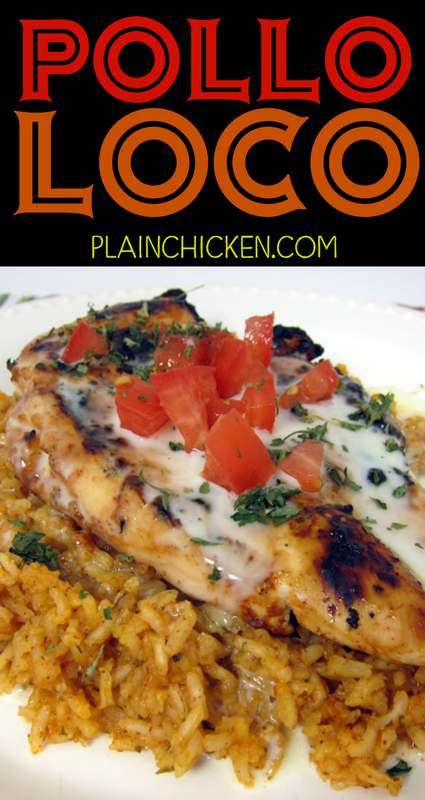 Pollo Loco - grilled chicken over Mexican rice and smothered in white queso - My favorite Mexican recipe! I literally licked my plate! SOOO good!! This could quite possibly be the best thing that I have ever made! We both took one bite and knew this was our new favorite meal. It was inspired by a dish Chicken Legs had when he was out of town. He described the dish to me, and I thought it sounded like something I would like. I decided to take a shot at it and recreate it at home. It was unbelievable! The chicken had a fabulous flavor, and the Mexican rice was spot on! We will never have to go out for Mexican again. Chicken Legs said this was so good that he could write my blog post today -"YOU MUST MAKE THIS!" Well said! Pour Lawrys Baja Chipotle Marinade over chicken and let marinate in the refrigerator for 30 minutes or overnight. When ready, grill chicken until done (165 degrees). While the chicken is grilling prepare the rice. Heat oil in a large saucepan over medium heat and add rice. Cook, stirring constantly, until puffed and golden. While rice is cooking, sprinkle with salt and Southwestern/Taco seasoning. Stir in onion flakes, tomato sauce and chicken broth; bring to a boil. Reduce heat to low, cover and simmer for 20 to 25 minutes. Fluff with a fork. Heat cheese dip according to package directions set aside. To assemble the Pollo Loco - place 1/4 of the rice on a plate, top with grilled chicken. Pour 2-3 Tbsp cheese dip over chicken and rice and top with chopped tomatoes. Your chicken Dishes are lovable. This one also seems very interesting to make & eat. The white creamy cheese over the chicken is making the dish more zesty. Great Share ! Cheers ! That looks better than the ones I've had out! It looks delicious and with all the great food you make, calling it your best ever, certainly moved it to the top of my try list. Sounds yum! And easy, to boot! This looks amazing, I can't wait to make it!!! Going to add this to my menu for next week when all of the fun starts at my house. That picture is screaming "MAKE ME" too! Copying this right away. Sold! I'll be making this very soon. I want to make this, but I live in a rural area and neither of the grocery stores carries Lawry's Baja Chipotle. Can you tell me what the flavors are in it so I can possibly recreate it? Thanks! TammyJapan - you can use Lawry's Mesquite marinade if you can't find the new Baja Chipotle. The flavors are very similar. Good Luck! I definitely need this in my life...yum! I made this last night and it was delicious...I actually used the Carribean jerk marinade since my store didn't have the Baja Chipotle. Hubby and kids gave it 5 stars! !Delicious and easy...Thanks! mcamanda5 - So glad your family liked it! I could eat this once a week - I love it! I made this last night and really enjoyed it! I used Arizona Dreaming from Penzey's spices in the rice. Next time I think I'll try to incorporate some corn and black beans into the rice as well. Thanks for sharing this great recipe! My family LOVED this Loco Chicken and it was so easy! Made enough for leftovers, but there weren't any. My teenage son asked me to make it again tomorrow night. A new family favorite! Thanks, Steph. This was sooo good! My husband gobbled it up and talked about it for the rest of the night. I had to go to 3 different stores to find the Baja Chipotle, but it made the dish. So much great flavor here! Made this for dinner last night - I honestly ate so much I was sick. THIS IS SOOO GOOD! Thanks for sharing! Angie - if you find a program let me know. I am also addicted to this dish!! I've been making this recipe for about a year now and it's truly a family-favorite at our house. Thank you so much for sharing! I hate to ask, but what kinds of herbs/spices do you think would work as a substitute for the Lawry's? I am gluten free, so their marinades are a huge no-no for me. I'm dying to make this because it looks amazing. Thanks for any help you can offer. I have it on the menu for next week, but I'm afraid skipping the marinade will mess it all up. Some how I didn't notice the queso dip part of the recipe so I had to leave it off, but this was still delicious! We used the mesquite marindae and loved it! I absolutely adore Pollo Loco!!!! I can't wait to try your version this week. I LOVE every single recipe I've ever made of yours and want you to know how much I appreciate the time you take on your recipes and blog. Thank you so much!! I would love to make this, however I cannot find any of that type cheese/dip you listed. Is there anything i can sub for it? We live in an apartment and don't have access to a grill :( Is there another process we could use to cook the chicken? You can cook it a few minutes on each side in the skillet and then finish baking in the oven at 400 degrees for about 10 minutes. Enjoy! When cooking it in the skillet do you use any oil or anything? @lucylou231 yes - cook it in a tablespoon or so of oil and then finish it in the oven. Enjoy! I can't find either of those marinades.....what can I substitute? Would a sweet roasted chipotle barbecue sauce work for the marinade? Love this recipe! Sometimes I make the rice as a side dish to other Mexican entrees. I adapted the rice recipe for the Instant Pot by reducing liquids to 1 cup chicken broth and 1/4 cup tomato sauce/puree, to satisfy the rule of thumb liquid to rice ratio of 1:1. Sauteed the rice and seasoning just like the recipe states, then cook manual (high pressure) for 3 minutes and natural pressure release (at least 15 minutes, i let mine go closer to 30 because i was doing something else). Worked like a charm and didn't have to watch the pot!! Thanks for a great recipe!! Made this tonight. Pollo loco is one of my favorite Mexican dishes. Absolutely loved it!!!! I added cilantro and put it on a tortilla. I also sliced up an avocado and lime. Great recipe. Thanks for sharing. So good, it's a keeper. I did have a problem finding the McCommick's Southwest Seasoning looked in 3 stores, so I used taco seasoning, still looking for Southwest Seasoning. After I saw your comment and starting putting my list together, I checked Meijer, Kroger, Walmart, Target and store here that carries everything from around the world. If you can’t fijd something, go there. They didn’t have it either. I emailed McCormick and they told me they discontinued both lines of southwest seasoning they had (the salt free and an organic). Mrs. Dash sells a southwest blend and Target has a Market Pantry blend like Mrs. Dash. Hope that helps! I made this today and it was wonderful! I had to go to Kroger to get the Lawry’s Baja Chipotle marinade but it made the dish. I used white instant rice instead of brown and it was excellent.